And we’re off! 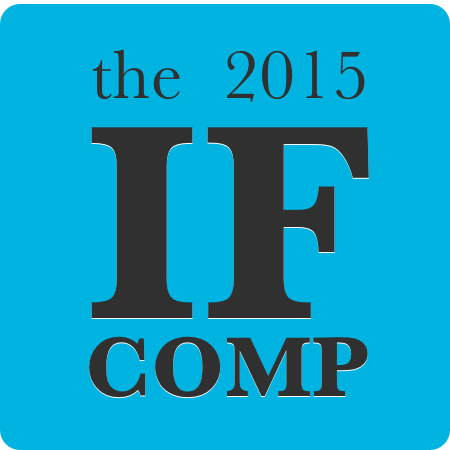 The games of IF Comp 2015 are now available. There are a record number of games this year — 55 in all — beating out the previous high of 53 in 2000. This is especially impressive when you consider this competition is now in its 21st year. I will be reviewing, but I’ve made some changes to my reviewing policy: specifically, no longer reviewing works for which my overall impression is negative. This doesn’t mean I’m binding myself to say only positive things, just that the overall take of the review needs to be a net Recommend. In doing this, I’m responding to assorted feedback over the years that the comp can be too harsh to new authors and to those unfamiliar with its expectations. The IF world has grown bigger, richer, and more diverse over the past couple of years, which is a terrific thing; it means we get games from everyone from published authors and pro game devs to teenagers making their first experiment with a game making tool. But the diversity also means that not every game is likely to be for everyone, and that’s okay. If you are also reviewing, thank you! I love reading other people’s reviews, and one of the great things about the comp is the community of discussion that surrounds it. Also, hydrate. 55 games is a lot. Okay. :Puts on Batsuit. : Let’s do this. This entry was posted in announcements, Competitions by Emily Short. Bookmark the permalink.